In 1989, Memorial Day Weekend was still the official opening weekend of the summer movie season, and home to one of the biggest films of the year, Indiana Jones and the Last Crusade, which was pretty much the only show in town. Almost 20 years later, it's not exactly the start of summer anymore, but other things haven't changed very much, with one of the most beloved movie characters of all time returning to the big screen. 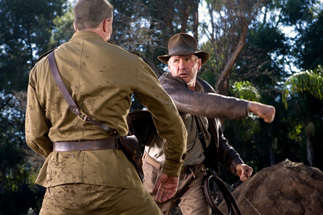 This Memorial Day weekend, it's Indiana Jones once again as about the only film to see, in the fourth installment of the series, The Kingdom of the Crystal Skull. Last Crusade's ride out into the sunset had seemed to close the door on Indy and his archaeological adventures, with neither director Steven Spielberg or star Harrison Ford all that interested in revisiting the character, but time, as well as faltering careers, can change a lot of things. It's been eight years since Ford was in a film that broke $100 million, 2000's What Lies Beneath, which makes his return to his arguably second-most famous character a natural move. We pick up with Indy in 1957, at the height of the Cold War, battling Soviet agents (including one played by Cate Blanchett) in the search for a mystical artifact from South America that could grant ultimate power over the entire world. So, same ol', same ol', really. Crystal Skull is a bit of a reflection back through the previous three films, including bringing back a very well kept together Kate Allen from Raiders of the Last Ark as Indy's love interest, Marion. There are also additional callbacks spread throughout the film for fans of the series, according to Spielberg, making this a great big cinematic nostalgia trip.